It’s reveal day!!! 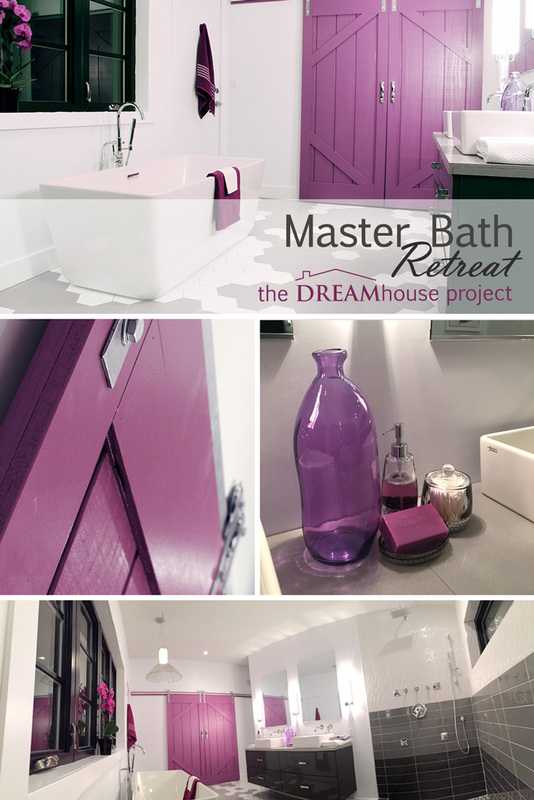 We’re so excited to have made it through to the end of this One Room Challenge to share with you the first completed space in the Dreamhouse – our Master Bath Retreat! I’m still in awe of everything that we were able to accomplish in such a short time. I couldn’t be happier with how it all came together, but when I walk into our master bath now, I still don’t recognize it. It’s a little bit comical because since the rest of the house is still so unfinished, it feels like I’ve been transported into some swanky hotel bathroom amid all of the sawdust & tools. It really is amazing to finally have one completed space in the house though – gives us that extra bit of motivation to get the rest of the house done now that we have this as a reminder of what it’ll all be like. 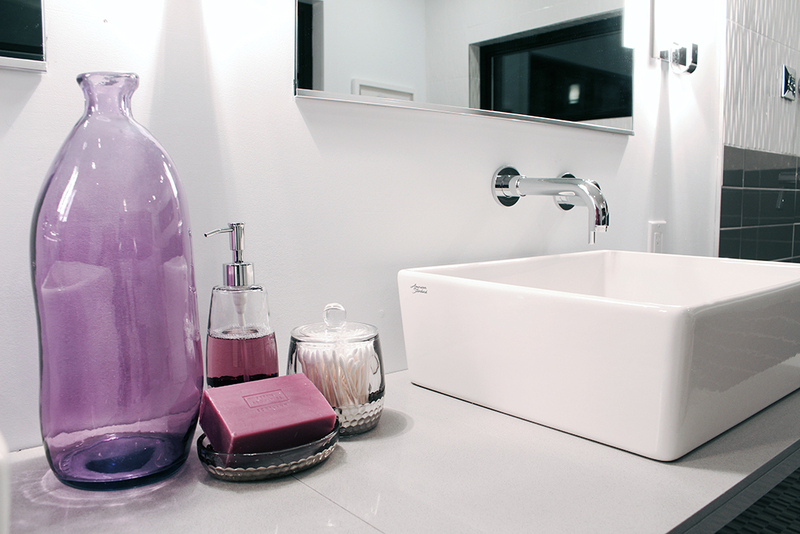 We created the floating vanity wall by taking 2 IKEA high-gloss grey sink cabinets & mounting them side by side. We topped them with a DIY quartz tile countertop and added his & hers Loft above counter sinks. Two mirrors were then centered between vertical sconces and finally these gorgeous wall mounted faucets from Delta were installed to finish things off for a modern, elegant look. 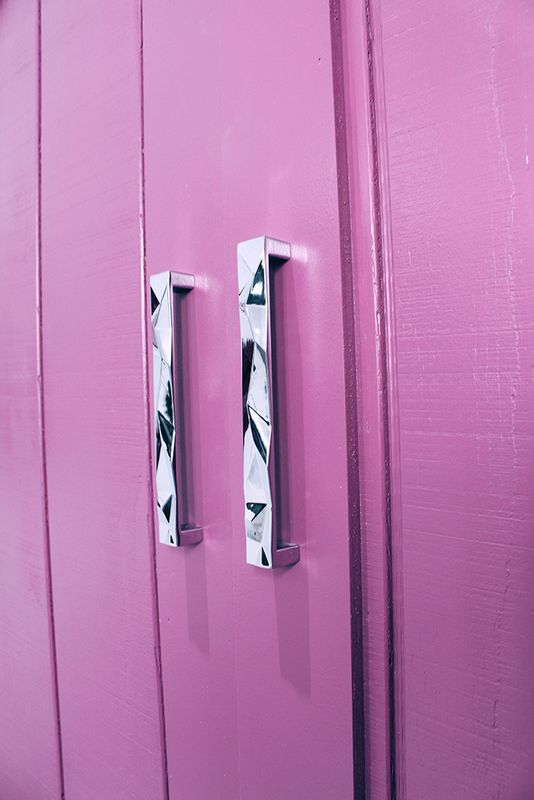 A simple upgrade from the standard IKEA pulls gives the vanity an extra touch of glam. 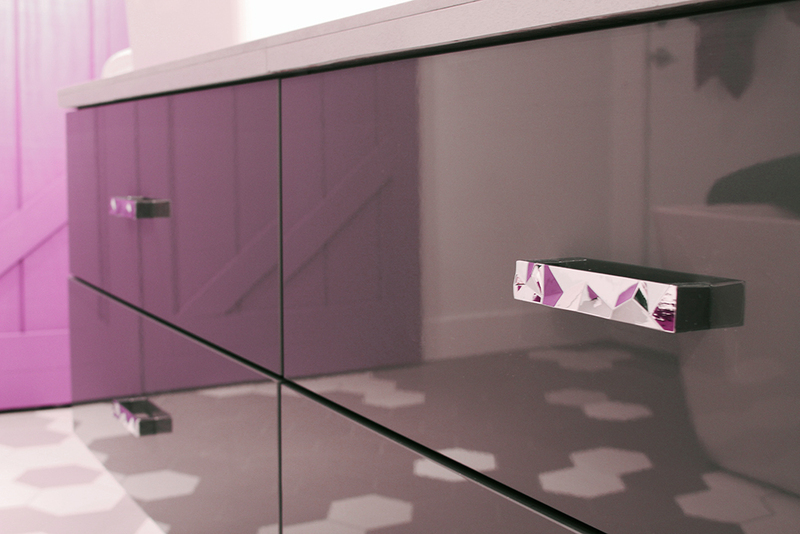 I love how the facets in the hardware pick up the colours of the other elements in the room and the way high-gloss finish on the sink cabinets reflect the floor! 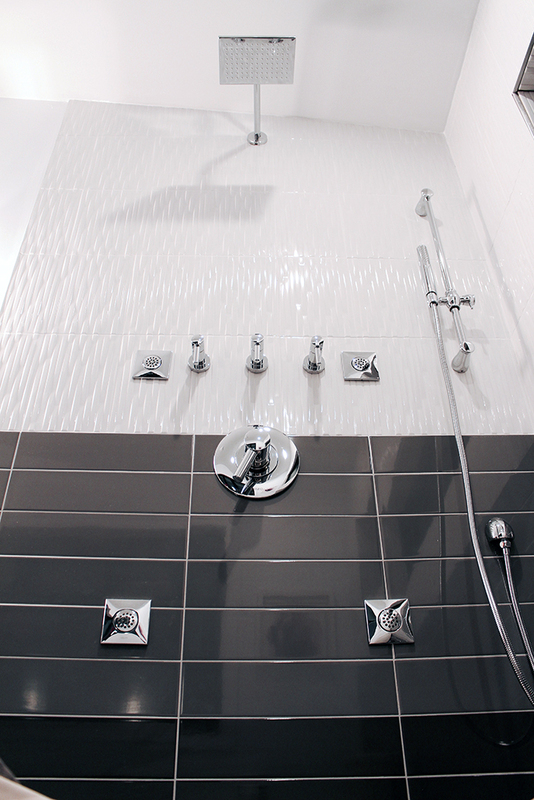 In the shower, we created an obmre effect on the walls by adding dark and light grey subway tiles, topped with a white basket-weave tile, for a touch of added texture. 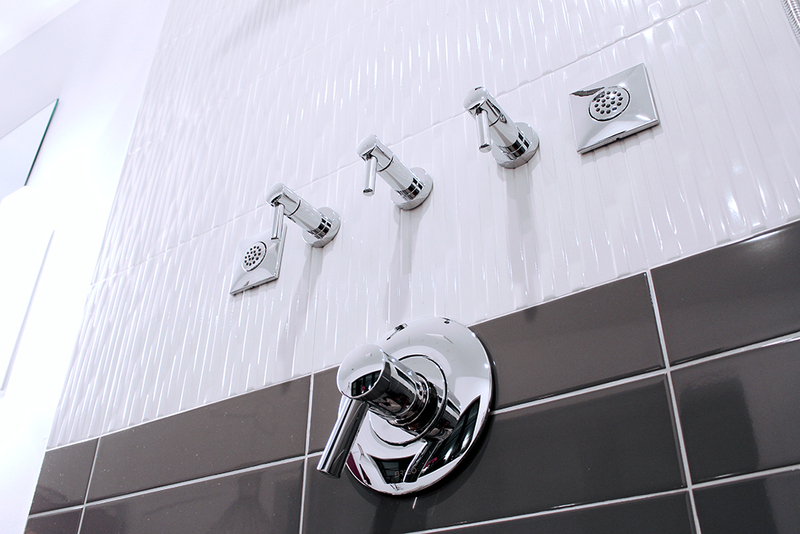 The shower fixtures are pure indulgence with a rain head, hand shower & 4 body jets. 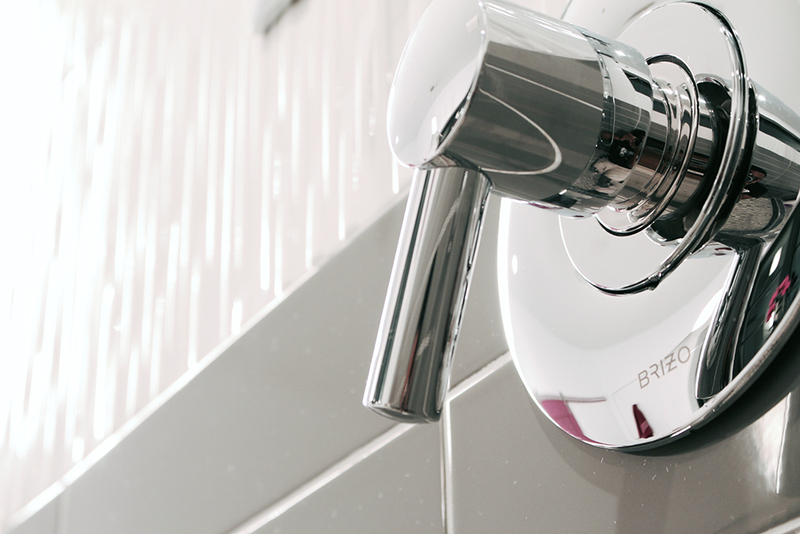 We chose the Brizo Sensori line for our shower and I absolutely LOVE the sleek styling of the Odin controls. 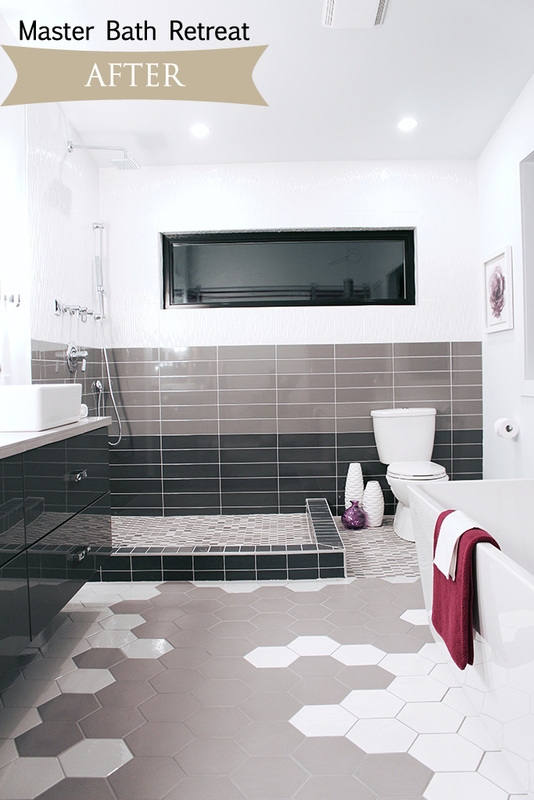 We installed hex floor tiles in two tones of grey and white, which add to fun, yet the modern aesthetic by creating a ‘splash’ of white to surround the tub . The focal point around the tub worked out better than I had imagined. 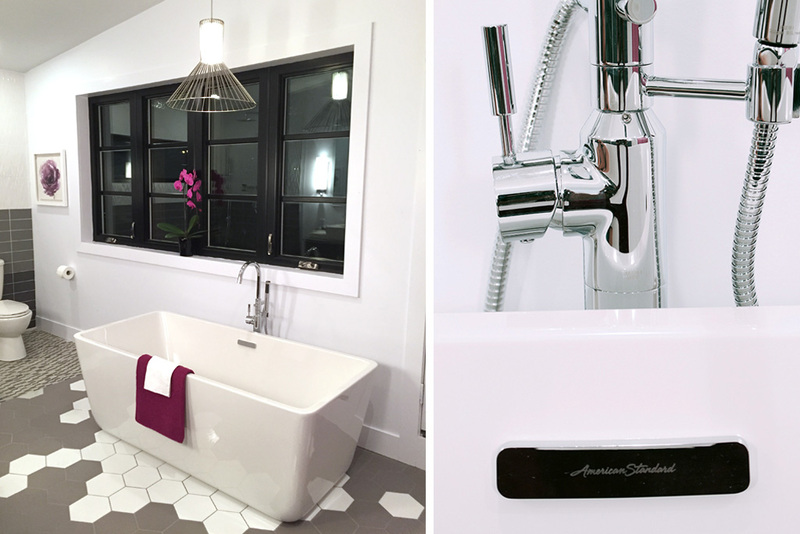 The Loft freestanding tub from American Standard is everything I hoped it would be and more. 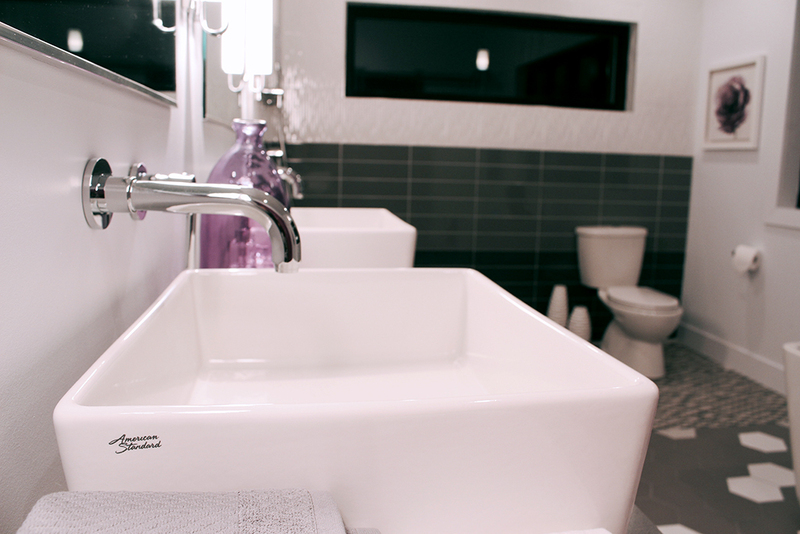 The lines are sleek & simple and it is the perfect compliment to our sinks. 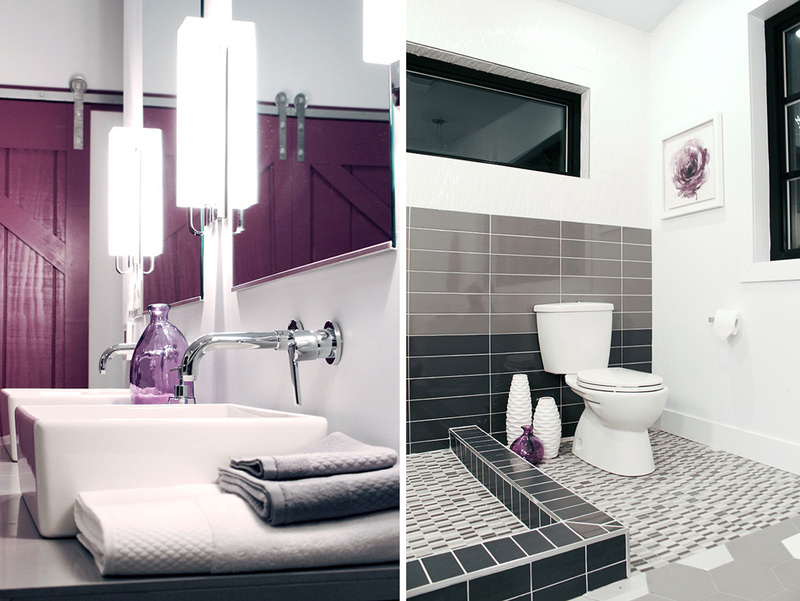 We’ve been fortunate enough to work with The Water Closet to source all of our plumbing fixtures for the Dreamhouse. They have a fantastic selection of products and were a huge help in choosing and sourcing all of the coordinating pieces for everything we needed. 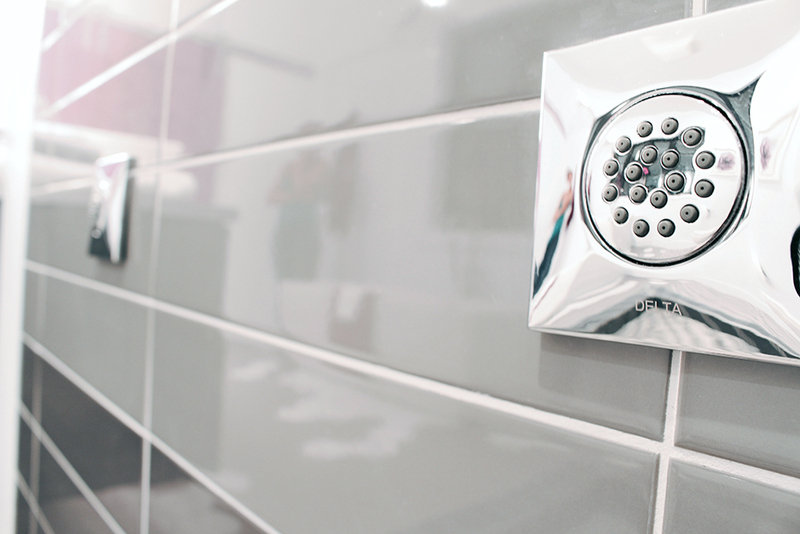 If you’re renovating a bathroom, I would definitely recommend you check them out. I also have to say a special thank you to our showroom consultant Diana for doing everything in her power to get our tub here on time for this reveal. I can’t wait to get into it with a very tall glass of wine! 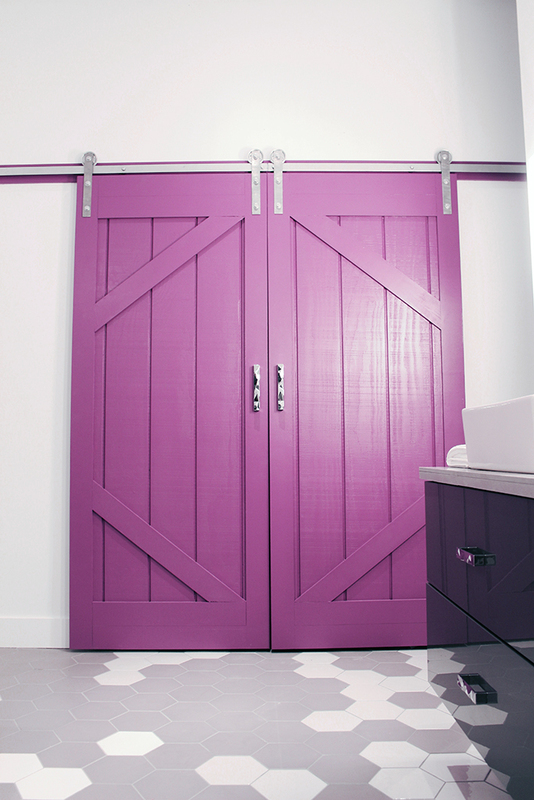 We also matched the handles on the barn doors with the ones on the vanity for consistency. How cool are they?? We decided to use the same pop of colour in our towels and accessories, which helps tie everything together. So that’s it! We made it to the finish line, albeit a little worse for wear and more sleep deprived than I care to admit. But looking at what we accomplished, I can say now it was all worth it! 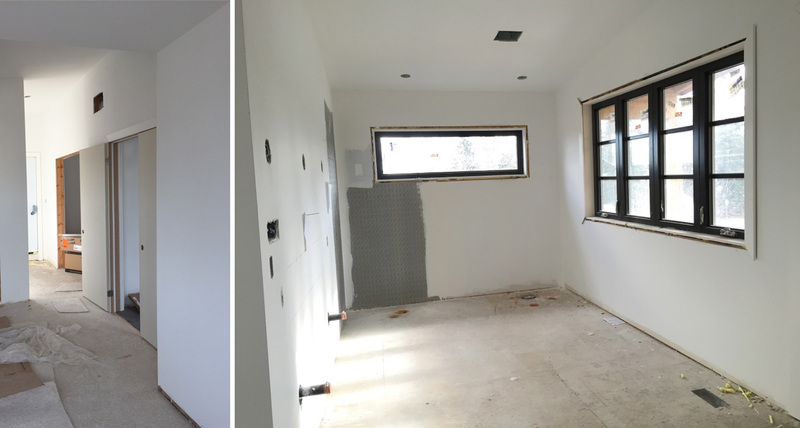 If you want to see the previous five weeks of work that went into our Master Bath Retreat, you can find them here. I want to give a GIANT thank you to Linda from Calling it Home for hosting the One Room Challenge and providing an avenue that gives so much inspiration and motivation to so many. If you haven’t yet seen what the 20 participants revealed, go check them out. Trust me, you won’t be disappointed! Don’t forget to also check in on the 150+ of us linking participants to see all that we’ve done. There are SO many incredible spaces being transformed, you’ll definitely need to set aside some time to look through them all! Disclosure: Through our partnership with The Water Closet, we were provided with preferential rates on all plumbing fixtures for the space. All paint was provided to us by PARA Paints. All opinions are our own. The floors and the door are AMAZING!! So fresh and chic!! Well done!! Thanks Traci! Those are definitely my two favourite parts of the room. Beautiful bathroom. Love that door and the pops of color. Thanks Erin! 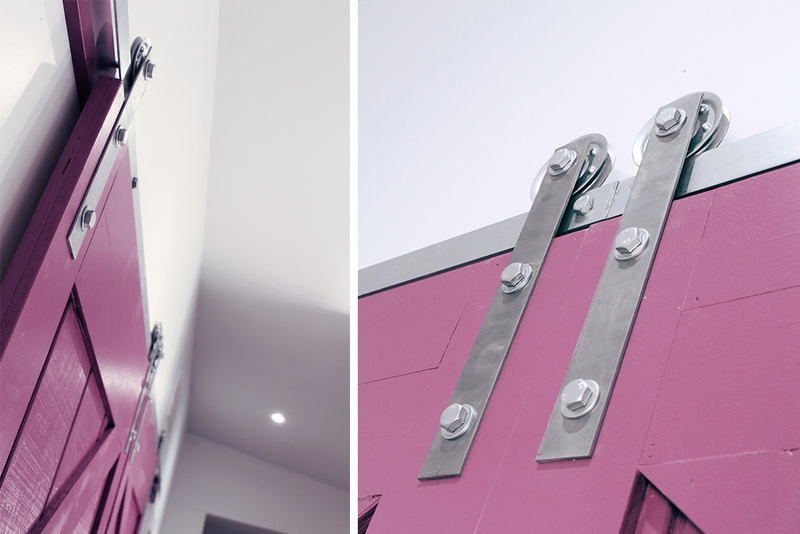 When we first told people we were putting in bright fuschia doors in the room, I think most thought we were crazy…and I have to admit when we put the first coat of paint on them, even I wondered if it was too bold. But once we got them hung, I knew we’d made the right call. I love absolutely love it. Your bathroom is incredible! I love everything…the tiles, your counter, that TUB and the doors! The doors are so great! Beautiful job! Thanks Jo-Anna!! I feel the same really. As we were shooting the photos all I could do was look around and think. Wow…we did this. And I love everything about it! Such an awesome feeling! I am in awe of your spirit, commitment and stamina ! It looks just like was intended ! Those barn doors! Wow! The whole room turned out great, but those doors definitely steal the show like you said. Thanks Sam! I love the floors. 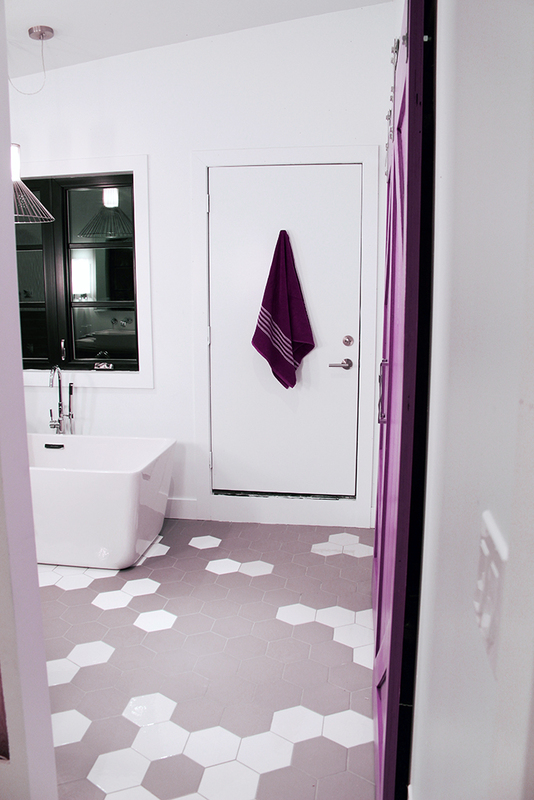 When everything was in progress, we actually thought the floors with the bold hex pattern and the focal “splash” around the tub would be the show stopper, but now that it’s all done, the doors really are the focal point that brings the whole colour scheme together. Absolutely wonderful! 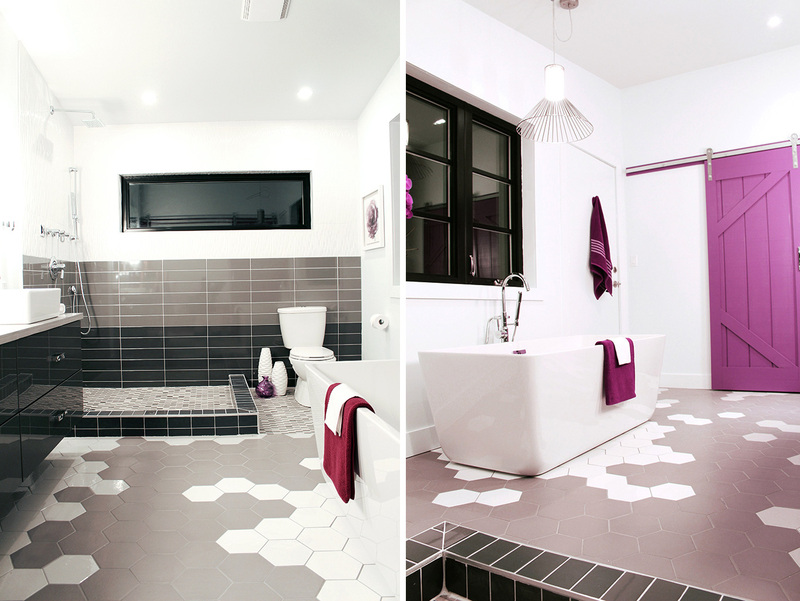 Excellent job on all the areas… love the ombre wall, the hex tile floor and the fuchsia doors… a huge grin came over my face the instant I saw them. Yes! Perfect! 🙂 Thanks Kathleen! That means a lot. Thanks for following along. Wow, just wow!! It looks like a hotel, so sleek. That pop of color is amazing! Thanks Virginia! The bold colour was a bit of a risk but I’m really glad we stuck with it! I love the tile! Everything about this makeover is incredible. Thanks Kendra! You did a fantastic job on your bathroom as well. Thanks for stopping by! Oh my word, amazing. I love it. That tub and those barn doors. Wow. OH wow!!! Looks fabulous… I love the bold pops of colour. Personality in that bathroom 🙂 Great job – was a lot of work, blood, sweat and tears I am sure. Now – go take a long bath with candles and a glass of wine! WOW! I turned out beautifully! The floors, the tub and THAT DOOR! It’s all stunning!!! Very nice, love that pink doors! Thanks Anna! We’re really happy with the colour! Wow! So dramatic — and that tub, is everything! Thanks Jen! The tub really is amazing! The angle on the sides is perfect for leaning back & relaxing with a good book and a glass of wine. Which I’m SO looking forward to! Wow, such an amazing result! 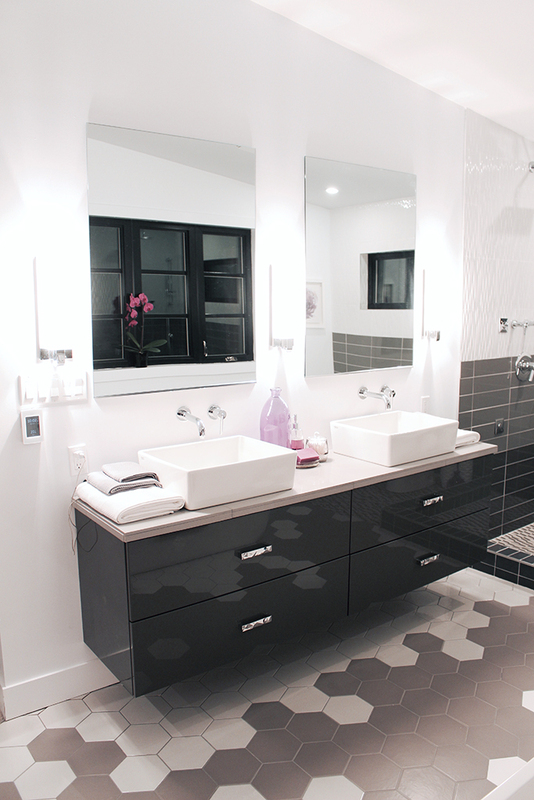 The bathroom looks so amazing and I love the contemporary style! Wow! This is stunning! 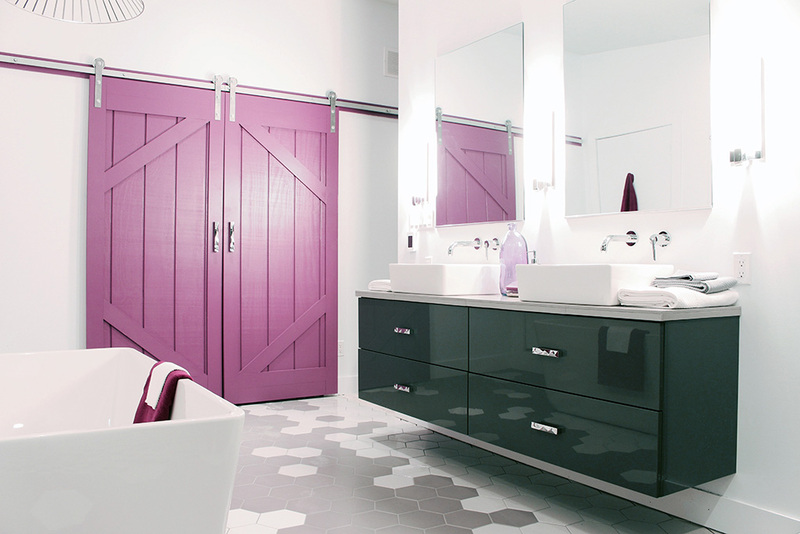 I looove the barn doors, and the pop of color added. Those sinks…ama-zing! I also did my children’s bathroom but now you’ve challenged me to focus on mine:-). Good job. Thanks Delia! Would love to see pics of yours when you’re done. Thanks for stopping by! This is so cool. I think it is the most unique use of modern mixed with barn doors. I love the colors you used. It is completely fun and unexpected throughout. Great job. WOW! So slick,chic and just plain pretty!!! Love the slick lines and the color punch you added! Thanks Vel! Appreciate you stopping by! Oh holy goodness that is gorgeous!! Love that amazing pop of color on those sliding doors!! Nice job!! Thanks Lynn! We’re really loving the colour too! How cool is this! That door and it’s color is to die for. Kapow! This space is awesome and I am not even a purple person! But the way you used color is perfect! So much thought and planning to create a gorgeous space like this! Thanks so much Sherry! 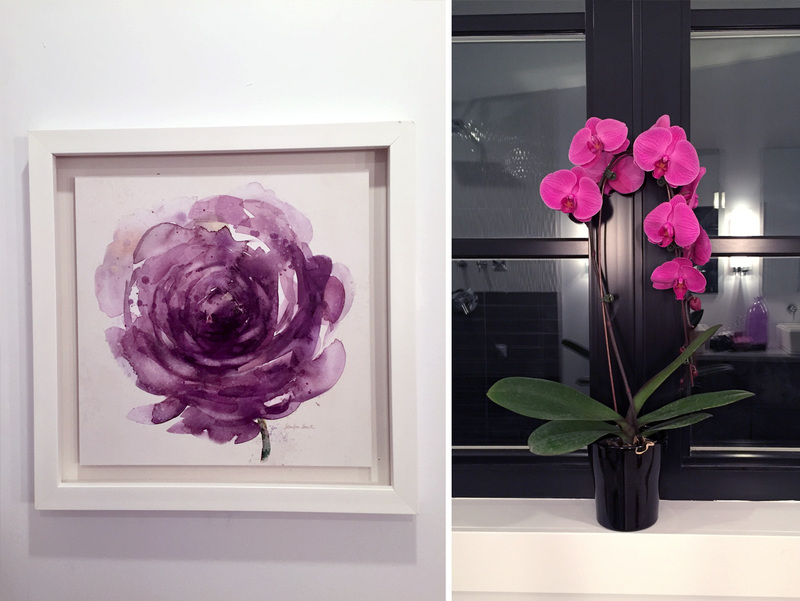 I know bold colours aren’t for everyone, but I think using it in the right context can really add a bit of wow factor to a space. Thanks for stopping by! I love your bathroom. And I absolutely love your barn door. Where did you buy your hex tiles? This room completely blows my mind! I LOVE it is an understatement!